Our range of products include spring washer. 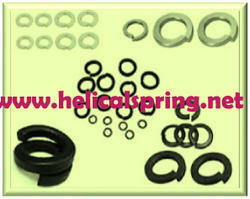 ASCO one of the biggest suppliers of quality Spring Washers in the Worldwide market. Asco wide range of Spring Washers find its diverse application in different industries. These Spring Washers are specially designed to suit the joint requirements rather than settle for a standard part. Apart from this, these can be availed in various shapes and sizes according to all the requirements of our valued clients. Asco manufacturer of Machined Plain Washers. Durable in quality and having longer working life, these plain washers manufactured by us. These plain washers are durable in quality and assure the clients of longer working life. Asco offer our clients normal plain washers, available in different size options, dimensions and finishes to suit different industrial applications. Fabricated using superior grade stainless steel, mild steel and brass, these plain washer are widely acknowledged for their flawless finish and durability standards. Looking for Spring Washer ?